Lady Slipper is a one room apartment on the second floor of our main timber frame lodge. Nestled on the backside of our headquarters, Lady Slipper offers seclusion with easy access. 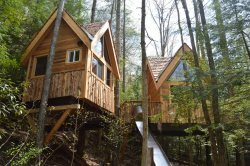 It has a separate entrance and a private patio nestled right up against the forest canopy, and a cozy kitchenette and private bath inside -- make yourself at home! This is a perfect place for hikers, climbers and outdoor lovers, because you can hike right from your porch out onto the many miles of trails in the Red River Gorge Geological area. Please don't hesitate to phone us if you have questions or would like to make a reservation! Kitchen: Lady Slipper features a kitchenette complete with a 2 burner stovetop, toaster oven, coffee pot, mini-fridge and sink. Cookware, dishware, dish soap and kitchen linens are also provided. Living/Dining: Table for two inside and a private porch with outdoor seating. Additional Amenities: Air conditioning, electric space heater, ceiling fan and box fan, and shared fire pit.